Nepal Field Coordinator Abhishek Basnet speaks with a woman about her community's new tapstand. Local women and volunteers dig paths for pipelines in Nepal. During the first phase of each of Wine to Water’s projects, W|W staff and community partners focus on finding sustainable sources of water in the community - this can take the form of natural streams, rivers, or underground water sources that require boreholes to be dug in order to access the resource. Once a source is located near the community, the water quality is tested in order to best assess the community’s filtration needs - as long as W|W has the current technology to solve any impurities found in the water source, it’s time to get to work. At this point, boreholes are drilled, reservoirs built, and volunteers brought in to assist the community in water system construction. Volunteers and local community members work side-by-side to dig ditches for pipeline placement, mix concrete, and work toward an end to the Global Water Crisis. Nepal International Fellow Pavan Mudiam helps to outline a pipeline in Nepal. 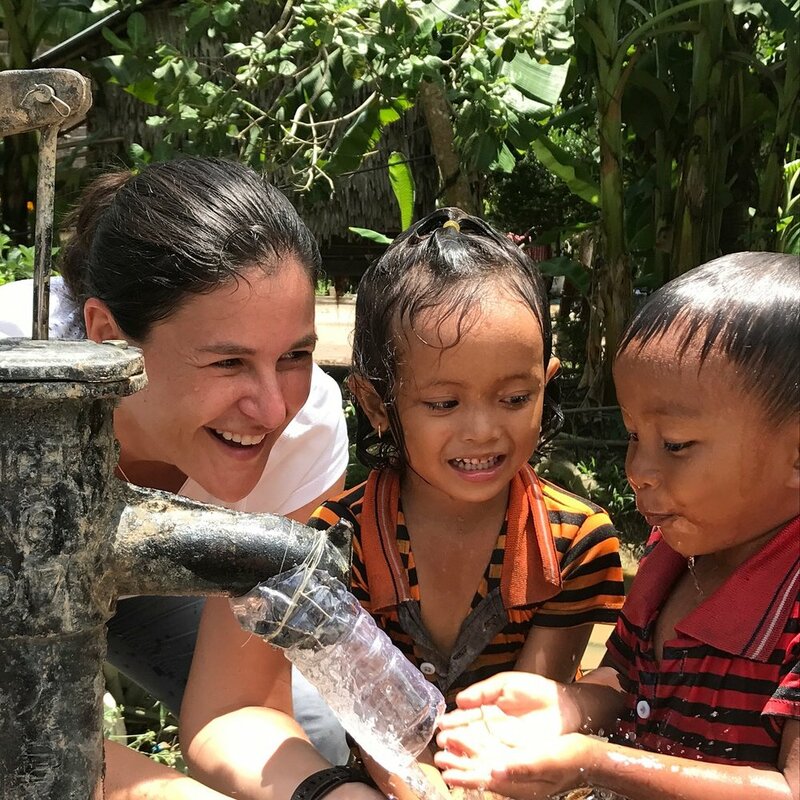 W|W Volunteer Program Director, Lisa Merritt, teaches young children how to use their new hand-pump well. This phase took place in Dahakhani, Nepal this past year - the location of W|W’s longest project to date. International Fellow Pavan Mudiam has been with this project since its inception. He began his journey by building relationships and trust with community members. He joined them in climbing steep slopes and cutting paths through the forest in order to measure and outline potential pipeline paths to the community from the water source, a nearby natural spring nearly an hour away from the village. Today, pipelines have been put into place and tapstands constructed by the hands of dedicated community members and W|W volunteers in Dahakhani, and the program is moving on to its next phase: WASH Education.